Heather Reed thought she was making the right choice when she decided to raise her daughter, Angel, on her own. But three years later, Heather realizes she needs help. Her career as an actress is faltering, and Angel’s more than she can handle alone. It’s time to track down Angel’s father…only problem is, he doesn’t know Angel exists. Heather’s search leads her to Whispering Wind, Wyoming. If Todd Winston is dismayed to see his old girlfriend show up in town, he’s shocked when he looks into the angelic eyes of the little girl who is clearly his daughter. Todd flatly refuses to open his life to Angel. Heather flatly refuses to leave town until she finds out why. Amazingly, they discover that through compromise and understanding lies the road straight to family. Angel Mine was a very pleasant enjoyable listen. Christine Traister did an admirable narration that kept me engaged and I am certain it added to the story in general. This is the story of Heather who arrives in a small town in Wyoming to introduce her daughter to her Daddy. Unsuspecting Todd is taken completely by surprise. Because of an incident in his childhood when he had been watching his sister, Todd is wary of children and doesn't see himself as father material. Heather and the inimitable three year old Angel, set about changing attitudes and beliefs. There is also a small cast of minor characters that flesh out the book and give it a warm, small town, family appeal. 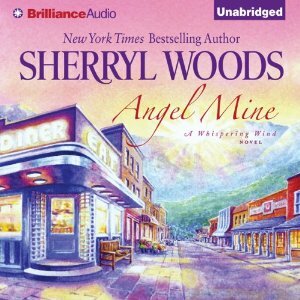 It is pretty much a typical Sherryl Woods story that I enjoy. I love a good interesting and easy audiobook. I will have to check this one out! Sounds good. Woods is one that's been on my tbr pile for a long while.